Well I am on the fence as to whether to send this quilt of to my partner or not. 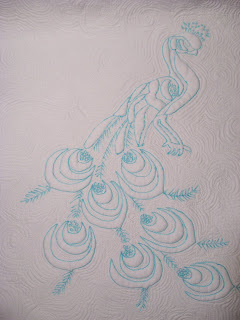 After stalking browsing through my partner's blog I have come to the conclusion that this certain person prefers more traditional pieced blocks over artsy blocks and quilts. In my mind trapunto is very traditional... but I can't decide if my chosen subject is too artsy for my partner's taste. I think that who ever receives this little quilt will appreciate it (hopefully) and all the hard work that went into it. But if it's not your taste, it's not your taste and there is nothing you can do about it. If you are like me you won't display it (at least not anywhere prominent) but might keep it tucked away because you still like it and appreciate it... or you might let your kids claim it. Soooo.... I have decided to finish it up and hope to get some feedback from my unsuspecting partner. Once it is finished I will decide what to do with it. Besides there is plenty of time to whip up another quiltie if needed. allow to dry completely - it may look like the ink is gone but it may reappear! 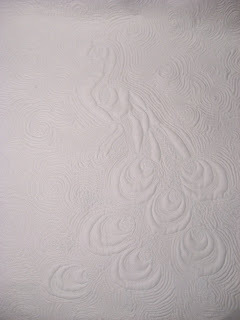 once dry look it over to see if the ink has reappeared anywhere on the quilt - if so, wet again. If not, you are done and can know use an iron on your quilt. well, its stunning! i like the blue ink to GREAT JOB! i think it fits nicely between traditional and modern/artsy. i don't think that artsiness of it overwhelms the traditional technique. i think it just looks clean and modern, and really seems like it could fit in just about anywhere. if you're still on the fence, make something else and decide which you like better!